As three of the moderators are very busy, and as moi is slacking, we have a second Guest Author this week – Gorgeous Dunny, with one of his Memoirs of a Country Employment Counsellor. Many thanks, GD! Inspiration and life lessons can spring from the most unlikely sources. 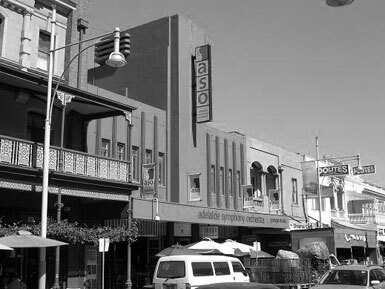 One of the most significant moments for me occurred when a group of us young men went along to the then new San Moritz Ice Skating Rink at Hindley Street Adelaide in the early 1960s. None of our group knew anything about ice-skating. In fact, I was the only one that had even been on roller skates. After getting our skates fitted we ventured on to the rink. The surface to my feel seemed very fast, as if the ground was slipping away from under you. It was totally unlike roller skates. The others were as intimidated, and like the hundreds of other new skaters, we cautiously made our way around clinging firmly to the rails. Not so, Carnesy, another member of our group. He astonished us by going straight out into the middle of the rink, immediately falling flat on his back. That’s another thing about ice, too. Once he hit the rink, his clothes became soaked with water. He was rescued by officials and placed on dry ground, but was quite undeterred. As soon as he’d wiped enough loose water from his clothes, he went back and repeated it: out into the middle of the rink, falling straight away onto his back, and carried off. Again he was soon back, varying the procedure only by occasionally falling forward or sideways. He was tall, and with arms and legs outstretched as he lay face down on the ice, he took up quite a bit of rink space. At one point, another passing blade skater went straight over his hands, leading to blood everywhere -on the rink and on Carnesy’s hands and clothes. After a little first aid and drying off, he resumed. It was as before, going out into the middle and almost as quickly falling over. To us, he was proving a greater entertainment than the attractive young girls in their brief skating outfits. Certainly among the crowd making their way around the rink rails, he was a big attraction as he found new ways of crashing. But one strange thing happened towards the end of the night, and since I hadn’t noticed any change I was truly astonished. The lesson seemed to me that if you wanted to learn something, you had to leave the safety of the rails. So what, if you made a fool of yourself and were laughed at? Nothing much could be learned from the safety of the rails and the security of your friends. Falling over and getting yourself soaked is nothing if you can learn and take something from it. I applied that lesson in the two major careers of my life: tourism and counselling. In tourism, it helped because my quiet nature was not what you’d expect in sales-type work, where extroverts were predominant. All the time I encouraged myself, leave the safety of the rails, never be afraid of falling over if you can reach towards your end goal. It was similar when I entered labour market and then employment counselling work. Never be afraid of mistakes. Always be clear on your end purpose and goal, regardless of where you might be at the moment. Often, of course, that end goal might not always be clear in detail. In counselling, that required a sharing of goals with the client. Often it did need considerable questioning, interviewing and research before we could reach an agreement on what was attainable. The school leaving age had been a vexed question over a long time. In the 1920s, my grandfather pulled my father, then aged 13 years, out from school. By the time I was at primary school, the minimum school leaving age was 14 years. It changed not long after to 15 years. The curriculum was loosely derived from the English Preparatory Schools model. That is, examinations were set at a standard considered likely to prepare a student for university study. Not only that, a student could only progress to a higher grade after passing the required level at that grade. Some students never did. It was not uncommon for some students to be up to three or four years older than the average class age. The consensus right up to my school days was that those students should be pulled out of school as soon as was allowed. The aim of supporting parents was to try to place such a person in a job where he/she might obtain reasonable skills and secure employment. That could involve low and semi-skilled occupations such as railway firemen and porters right through to trades apprenticeships. Often it led to very good employment outcomes for students that performed poorly in a prep school-type environment. Their particular skills were simply not suited either to literacy or abstract concepts found in a prep school curriculum. But give them something tangible to master and they could be highly functional and competent. Over the years it has led to opposing views on the merits of early school leaving. There has been an assumption, in this post-Keynesian age of higher unemployment and greater uncertainty, that retention at school is better. Employers, often having too many applicants for their vacancies, take the simplest method of screening, such as looking at school-level attainment. Those completing year 11 or higher were assumed to be better qualified, than those only getting to year 9 or 10. It created a vacuum for early school leavers. Many aged 15-17 years could get low-skilled work, often at take-away food outlets, because of the low pay for their age. But once becoming older, they were no longer wage-competitive. Other younger ones took their positions, while they often did not have the skills or experience to compete with older workers. In South Australia, my department and TAFE looked at this problem. They came up with a system of offering pre-vocational trades training courses for young unemployed people. These courses were an excellent introduction to the trades. Those completing them were successful as trainees, gaining apprenticeships and thus skills and secure employment. So much so that employers actually preferred them to those finishing year 11. It saved the employer a lot of time on elementary and supervised tasks that they’d usually have to give to first year apprentices. With employers only wanting pre-vocational trainee graduates, pressure was soon applied to open such courses to all comers. As a consequence, the competition for places was intense. Most places, apart from a small quota for severely disadvantaged unemployed, went to those completing year 11 or better. So it was almost back to where it was. Those types of considerations were at work when Paul’s mother saw the Hamilton CES Manager and then was referred to me. The situation was a little complicated. After an unhappy first marriage she was determined to make her second one work. Equally, she was determined not to neglect her son by her first husband. He had settled uneasily into the new household, complicated also by the troubled times of early adolescence. Paul was not openly hostile, but rather silent towards the stepfather and his mother. He had alarmed her recently by declaring that he intended to leave school as soon as he turned 15 years next January (it was July then). He was only then completing year 9, and she thought it was far too early for him to be leaving school. She had not shifted his resolve, and she asked if I could talk to him. I agreed and arranged to interview him. Paul looked even younger than has 14 years, confirming to me his mother’s anxieties in his leaving school this early. Although he was quiet, he was quite clear in his resolve to leave school. I went through the usual run of employment anxieties associated with early school leaving. In particular, I expressed concern about how he could compete in a poor labour market. But none of it swayed his determination to leave. I left it unresolved for the interim, but felt I needed an alternative plan if I was to reach some sort of agreement between mother and son. I contacted Paul’s classroom teacher, who was empathetic and gave me a very detailed briefing on Paul’s position. He’d described Paul as an average student in the lower-performing spectrum of classroom students, but neither struggling nor badly-behaved at school. He said he believed that somewhere Paul had made up his mind that there was nothing further he could learn in a school environment. He believed that given Paul’s attitude that he was right to want to leave. It was an unexpected response from a professional educator, giving me further food for thought. Paul was my case client, but my sympathies at that point were with his mother. I had worked not much earlier at Elizabeth CES, scene of the highest rate of youth unemployment in the country. I believed then that you needed to take advantage of every chance to compete for scarce job/career opportunities. And if that meant passing year 11, so be it. But since I could convince neither Paul nor his teacher, I needed to try another approach. I felt I would need something different to achieve an agreed outcome. At that time, I had dealt with several apprenticeship placements. I was impressed by the training approach of on-the-job work and learning, combined with block release to TAFE workshops and classroom to get the formal qualifications and theoretical knowledge. Never be afraid to do something different if it will achieve the desired goal. I wondered it we could work the converse of the apprenticeship approach. That is, have Paul on ‘block release’ from school classroom activities so that he could attend workshops where he’d work specifically with machines and tools. At that time Skillshare Hamilton had recently acquired some metal lathes and woodturning machines. A retired tradesman was in charge of the machines, teaching interested young people in how to use them to make things. I thought that possibly we could re-ignite his interest in learning by working at the practical task level. I discussed it with his teacher, who liked the idea, but cautioned it would have to be approved by the school. I called Paul in. He immediately liked the idea. He agreed to the only condition I put on it, that he’d be open to the option of staying on at school the following year. I put it to Skillshare, who were happy to oblige. I then went back to Paul’s teacher, who explained that what I proposed, although excellent, was unprecedented. He said it would need an expert opinion in writing to the Principal. Even then he doubted if it would be approved, but he’d support it as Paul’s classroom teacher. I knew it would take a special effort from me. In this country region, I was the nearest thing to an expert on vocational matters. Even so, I was neither Australian Psychological Society (APS) accredited, nor formally qualified as an Industrial Psychologist. In my Sydney days in the 70s, I’d been a successful poker player. One of the keys was to know when to fold early if the cards dealt offered only a small chance of improvement. Mostly I had a reputation of not bluffing. It was not strictly true, but disguised by my penchant for only continuing when I knew I had good cards. I resolved to try a bluff with the principal, helped a little by my English major and my ability to use language well. I would word it in such a way to give the impression of being an expert on the labour market, education and training. On the letterhead, I used a Department of Employment Education, Training and Youth Affairs (DEETYA) logo, not the branch Commonwealth Employment Service (CES) Hamilton one. I even used similar tactics with my own name. I didn’t cheat on my title as Employment Counsellor, but after my name I did the unprecedented of putting in BA (New England). That was more pretentious than I liked to be, and in any case the BA was a double English major. But that was essential to the bluff. If not looked at too closely I would pass muster as a qualified expert offering a recommendation for a student concerning his future. None of what I put in that letter was a lie. It was just done in such a way to give the illusion of an expert giving a professional opinion. And in another sense it was that. I proposed two hours release two days a week. The classroom teacher rang me and was delighted to inform me it was approved. I quickly alerted Paul, his mother and Skillshare to the decision and the days and hours of the release. All were pleased. After it was started, I called occasionally at Skillshare when Paul was there. Paul seemed happy enough, even if more interested in his Skillshare mentor than me. The mentor was convinced that he could get somewhere with Paul over the next four months to school’s end. Two months later, Paul’s mother called in to see me. She was delighted with the progress Paul was making. She said it was almost impossible to stop him talking about what he was doing working on the machines. That alone was a huge transformation from his nearly silent position previously. On a personal level, Paul’s interest in machines and tools had led to a warmer relationship with his stepfather, who as a farmer was very handy and had a range of tools and machines on the property. She believed that he would still probably leave school as soon as he turned 15 years, but she was no longer worried about his future. She was satisfied that he knew where he was going and would get whatever employment he sought. I gained similar information from his teacher. Paul was quite positive in school classes, but his heart was in the machining work. At the end of the school year, I called in Paul. He confirmed these points and expressed thanks for what I had done. He was definitely leaving but was satisfied he’d looked at all the issues. He actually had a job offer, thanks to his mentor at Skillshare, who had passed on his details to a prospective employer. The mentor was sure he was placed in good hands. The employer was a journeyman tradesman based a long way off at Sealake. He’d already met Paul and his family and given them assurances on his accommodation and support. It was not clear it could lead to an apprenticeship, but Paul believed that he would learn enough to have a good future. It was not exactly the outcome I’d been directly hoping for when I made this unusual arrangement. Yet I had to be pleased about it overall. He had a purpose in wanting to leave school. He knew what he needed to learn to get the type of work he wanted and could do. A clear vocational direction drawing on a person’s talents and potential is about all I could reasonably expect. Today, over twenty years later, the situation has improved for those students not needing an academic preparation. In Victoria, students can elect to take Victorian Certificate of Applied Learning (VCAL). It allows them a chance of obtaining more tangible skills that they can use in going for and obtaining work. In an interesting postscript ten years later, I suggested a somewhat similar plan to a friend who was deeply worried about his stepson’s progress through secondary school, and remained pessimistic about his chances of passing up to year 11 or 12 and getting a job of any kind given his shyness. Here, the lad had a passionate interest in computers and almost nothing else. At least the school system was more flexible by then. What I suggested was that he seek a release from secondary school to attend an information technology course at TAFE. The level of the course could be accredited towards his VCE anyway. Again there was a transformation once it was approved and he was released. He not only scored highly on the course, but at secondary college, his marks and his enthusiasm for other subjects improved, especially English. He got a good VCE score, and won an IT cadetship at his first application. None of this answers the question of the ‘right’ school leaving age. If anything it suggests that it will vary with the individual. But it does suggest that the traditional school environment is not suited to all, and that a lot of lessons can be learned in other parts of life. Even from something as simple as an ice skating rink. Good one! I think we will be seeing a lot more of that – er – posturing. Stand by for more unhinging – Campbell Newman has had a chat with Kevin Rudd abvout Gonski funding and the cross city rail project. It looks like he could be ready to do a deal. Tony was in Brisbane too, hardly anyone noticed. Mr Abbott was at my old school, Villanova College. The school was founded by Augustinian priests. No priests at the school any more but I can recall several Irish priests from the “old days” who would not be very happy, shall we say. Trying to catch up on discussion re old records but cannot access OLDER COMMENTS. The button is covered by “Comment Navigation” in bold type. Can anyone help? I experience this at work due to IE, the easiest solution I find is to ‘right click’ on view in the top bar and scroll down to ‘style’ and select ‘no style’. This allows you to see and access the ‘new comments’ link. Stand by, everyone, for the Friday thread at 5pm! NEW THREAD – FRIDAY FIREWORKS!